I'm excited to announce that I was nominated for a Shorty Award this year in the #localfood category. If you're on Twitter: I beg you, bribe you, encourage you to vote for me. It's all about sharing my passion for local food and our amazing local farmers. It's like a vote for me, is like a vote for them too. And, since once you've voted for me, I hope you'll also cast a vote for Local In Season in the #food category. 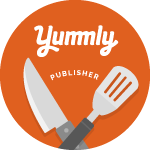 As a contributing writer for the site I can tell you first hand they are a wonderful group of passionate food people.